Meet Cryface – the crying face booth from the creator of the award winning #1 ranked app Vanity - Beauty meter! Providing a fun way to instantly make faces cry on your iPhone, iPod Touch & iPad, Cryface lets you capture and recreate that emotional moment and combines your photo with effects from your filters section to add make-up, black and white style photos, and meme text generator. The best one to use on family, friends or colleagues photos, Cryface app lets you then share your photos via email, Facebook, Twitter or MMS and allows generating your own meme! • Add text to an image to make a meme. CryFace is available in the Apple App Store and is compatible with iPhone, iPod touch, and iPad. The app requires iOS 4.3 or later to be fully functional and is entirely optimized for iPhone 5. 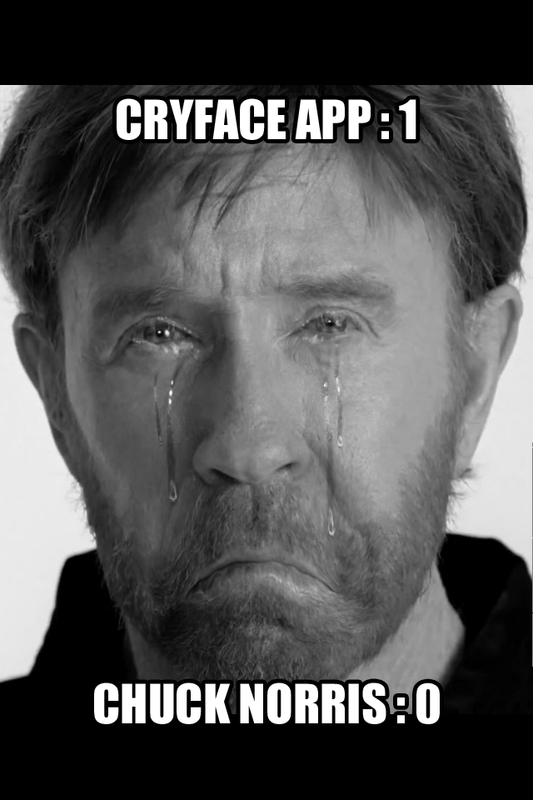 So go and grab it now, and make even Chuck Norris cry with Cryface for iOS!